Another great year has gone by and I have made leaps and bounds in terms of cosplay construction and performance! I made a great variety of costumes this year not only for myself but for some of my friends as well! Without further ado, here are my accomplishments! Katsucon is amazing and I want to go back so badddddddd!!! Traveling to cons with more than one room worth of people is the best experience! Large armour also attracts lots of attention, especially when in a group with other large amoured cosplayers! Curly wigs are so freaking adorable! This cosplay only required a dress to be made and a wig so my costs were reduced by buying from ebay and fabric discount stores. In total it cost me about $45 CAD. It's very understandable as to why this costume was the most expensive. It involves armour, lots of fabric, and a giant sword. While this costume is not complete (missing the sword), the price of it only lands in the $120 CAD range, which makes this cosplay not all that expensive. Again, this makes a lot of sense in terms of cosplay construction time. I worked on this one for 52 hours so far and the sword will probably add another 10 hours on top of that. The most time consuming part was probably the painting of all the armour. I had to paint many layers and of course there is drying time between each layer as well. I made this costume super quickly before Halloween. 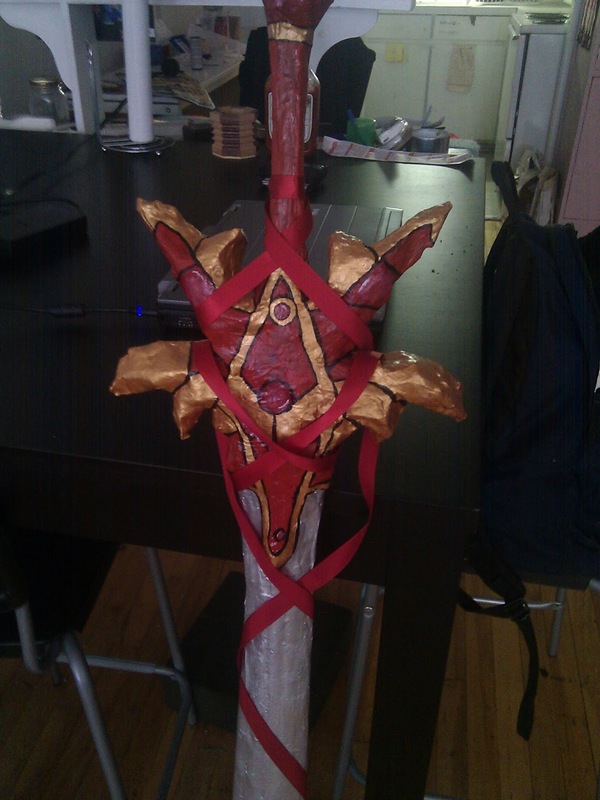 It took about 11 hours to make and is a great comfy costume to bring to faraway cons. Despite this costume being annoying in the form of making sure it doesn't tumble off my shoulders, it is a really fun costume to wear. People had great reactions to it and I've made some really cool friends because I was wearing this costume. I can't wait to make another Saber cosplay! I spent so much time working on this costume and I had so many doubts about certain things but when I finally finished it, the whole costume looked spectacular! I loved working on the armour and painting the tapestry. I'm super happy with the final look and I know what I would change should I ever make this costume again! Need I explain this?! Katsucon was such a freaking blast! It was the first time where we actually made friends at a con that we hung out with, went to party with and rode a mechanical bull with! Not to all the awesome cosplays I saw! I really want to go back again and next time I'll bring some really spectacular costumes as well! I was so nervous going to the Fate gathering! I had just started getting into the fandom, I hadn't played any of the games and I had only seen the original Fate/Stay Night anime. I shouldn't have worried though because I was warmly welcome by a bunch of fate cosplayers even before I got to the shoot location! I had so much fun that I decided that I needed to make another Fate cosplay, just for that one event at AN in 2016, and perhaps for every other years after that!